Decorate for Fall, Not Halloween: DIY to Last All Season! We all know the jack-o-lanterns aren’t going to last long after Halloween, but what if you created a look that blended fall-themed ideas for decorations, that could last through the entire autumn season? Trade in the ghouls for a lasting harvest with these simple ideas! Create your very own pumpkin patch with mix and match pumpkins. Use a range of sizes and colors; throw in a few white varieties, a gourd or two, and as many miniatures as you want. If you’re decorating inside, use pedestals, mason jars, hurricane lamps, and candlesticks to create different heights of pumpkins and add depths to your arrangement. Moving outside, add pumpkins, corn stalks, branches, and leaves to hay bales to represent the changing foliage. Mums have long been a symbol that cooler weather is ahead and can add color to any display. These calm and cool decorations can be a nice respite, even in the midst of a spooky military life. If you don’t want to leave out the scary while decorating, try picking some simple things that can easily be added or removed after the 31st. Scarecrows aren’t just for scaring the birds away anymore; they are a great crossover from Halloween to fall and the opportunity for a family project. Get a few bales of straw, repurpose old clothes, and let your imagination create a character for the fall season. 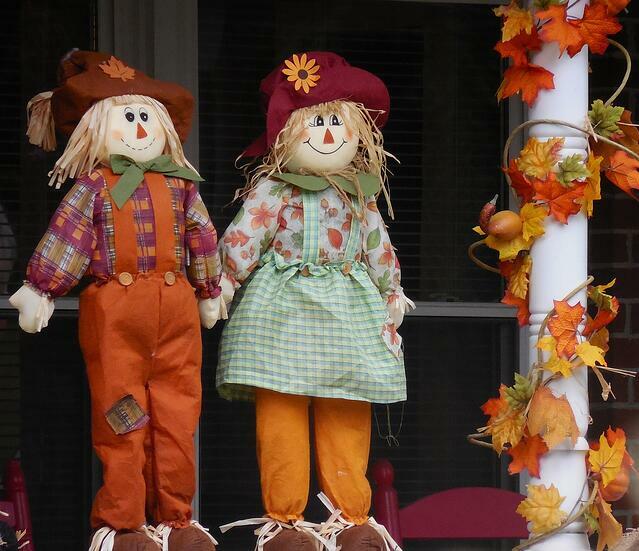 Sit the scarecrow on bales of hay on your front porch rocker for the neighbors to enjoy. 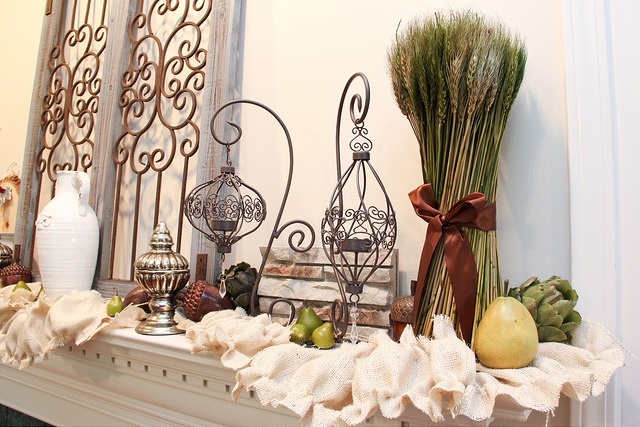 Natural finds can add a great mood to your indoor decor. Head outside and gather all the leaves, branches, berries, pine cones, and acorns you can find. 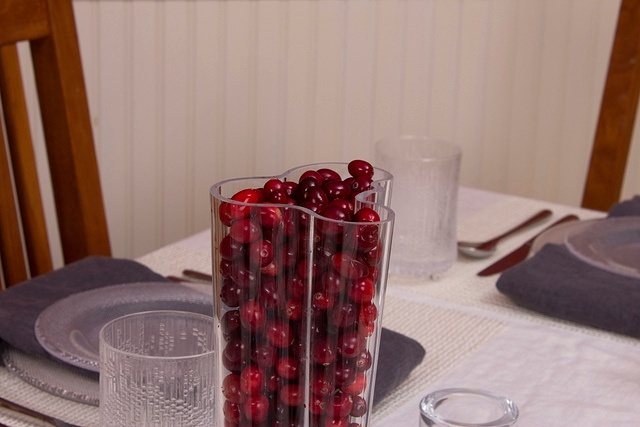 Use them to fill bowls and dishes or to add fall flair to a candle arrangement. Dried leaves glued on white sheets of paper and strung with twine make a simple statement piece and bring a reminder of the outdoors inside. Repurpose rustic treasures or create your own. Take a trip to your local farmers’ market or flea market in search of a farm object with rustic charm. Add a coat of paint to something you have laying around to give it a “rustic” feel. That tin bucket that has been sitting in the shed will become a fall tradition by just adding some paint and a dried flower arrangement. For inspiration, check out these fall project ideas. Not sure if you’re ready to trade in your ghosts and goblins for a bountiful harvest? Start simple by naturally updating or repurposing a few things. 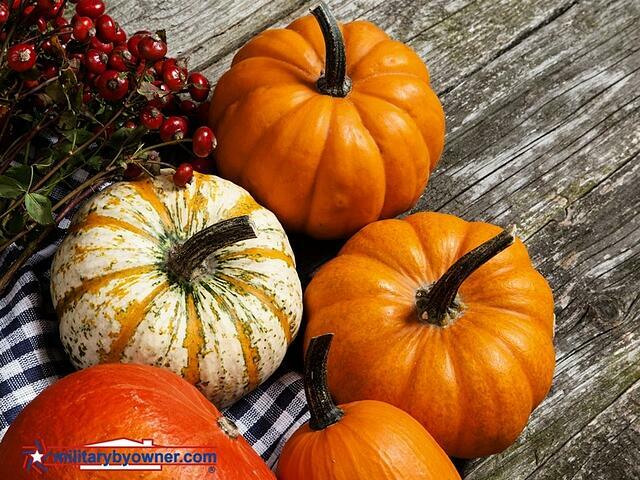 The key to fall decorating is to remember the best part of fall is the memories made and reignited by the smell of a candle or sight of a pumpkin patch. By Stacy Huisman for Military Spouse. Used with permission.